When it comes to getting drums down in my productions I prefer to play and sequence MIDI drum parts using drum virtual instruments and libraries rather than tracking a drummer with a live kit. Why? For two reasons - Firstly, I don't always have the time to wait for drum tracks to be delivered by online session drummers and secondly I prefer the arrangement flexibility that drum VIs provide when I am putting a song together in Pro Tools. If I find a drum section doesn't work as a production moves into a mix I change the MIDI notes suppose to getting a drummer to re-record. I've owned or used a vast majority of drum VIs over the years, in this article I list my top drum VI libraries including video and audio examples for each. Read on to discover why I use the following drum virtual instruments in my music production workflow. EZ Drummer 2 by Toontrack is bundled with a great selection of kits accessible through what I feel is one of the most straight forward drum virtual instrument GUIs around. The EZ Drummer 2 internal mixer is a no-nonsense approach to mixing that features basic volume & pan control with varying fixed dynamic processes such as compression and other tone shapers - depending on whatever kit is loaded. One of the best user features I love in the entire EZ Drummer system is the stand alone Toontrack Application Manager. I think it's one of the best Pro Audio application managers around. It's a simple three-click process for downloading, installing and authorising purchases in one window that has never gone wrong for me. It even informs me when a library has an update available. Here are a selection of EZX expansion packs reviews on Pro Tools Expert. A stand out feature of EZ Drummer 2 is the Song Creator. Users simply play a kick and snare pattern and the engine provides a selection of MIDI grooves that either match or resemble the input. This is a great way of getting drum parts arranged fast. Users that have limited abilities in either performing or sequencing MIDI drum grooves will also get a lot out of the Song Creator. 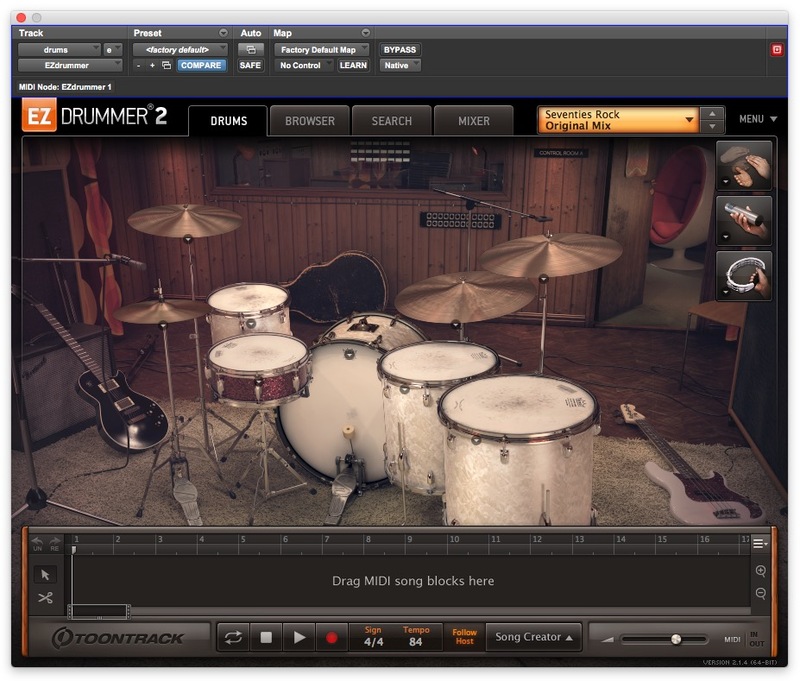 Like EZ Drummer 2, each library has a built-in mixer. The mixers found in these libraries feature a sophisticated set of EQ, compression and saturation controls. A feature set I adore in these libraries are the humanise controls. These enable me to add slight human vibes to MIDI parts such as delaying the timing in a random fashion ever so slightly off the beat like real drummers naturally do when recording to a ridged click track. I like to automate the timing humanise feature so that the drum performances are slightly looser in verses than in chorus sections. My favourite Abbey Road drum library is the 70s drums package. It includes two sets of very punchy dry kits. For me, these kits work in almost any song I produce in Pro Tools. Listen to the example song below to hear these in action with the timing humanise feature automating between 10% to 15% off the click. Sometimes a song doesn't require acoustic drums. Native Instruments Battery is the drum virtual instrument I use when I need electronic sounding drum parts. It comes bundled with a vast selection of drum hits and the GUI is laid out like a drum pad. The effects engine in Battery is fully featured, I find there isn't a time that I don't tweak a sample's effect chain to shape it for whatever mix I'm working on. This is an electric drum VI that I feel has no creative limits for getting unique drum sounds from. AIR Boom is an old favourite of mine and is bundled free with Pro Tools. I use it to thicken up main drum parts in my productions. I don't work on styles of music that require 808 sounding feature kits, instead, I use the 808 sounds in Boom as supporting samples for acoustic drum VI kick and snare notes. Listen to the example below as you'll hear the snare and kick are very bold in the mix. This was achieved by copying the snare and kick MIDI notes from the acoustic drums MIDI and running them through Boom. When Steven Slate Drums released the Blackbird Studio SSD expansion pack I heard some of the examples and was very impressed. This forced me into purchasing the main SSD instrument as I needed it to get the Blackbird drums pack working. I've always felt that the Steven Slate Drums GUI focuses heavily on each individual sample set suppose to the drum instrument as a whole. Unlike other drum virtual instruments this doesn't include built-in processors or effects, nor does it include any humaniser features. I prefer the Blackbird sample set over the SSD bundled samples as the Blackbird drums sound rich, powerful and focused. The samples in both the standard and Blackbird sets do sadly have an Achilles heal, I find that neither can achieve subtle dynamics very well. Don't get me wrong, these samples sound great but I've found them to be too punchy and heavy in productions that require a softer touch. Out of the drum virtual instruments in this list the Steven Slate Drums instrument is the only drum VI I will try to use but will quickly abandon if I don't get results fast.